While perhaps not the most mold-breaking rhymes ever conceived, it felt fitting to place this familiar beginning picture of a collective daily music discovery dilemma within the frame of an imagination-fueled narrative because that is exactly what one is signing up for when playing “Grey Wolf,” the debut single from New York’s Storytellers. “Grey Wolf” is a behemoth of a debut single, at only two seconds shy of 10 full minutes but wait, don’t turn away out of fear of excess. Storytellers is a band whose music is exactly that: elaborate storytelling. Yes, 99.9% of songs tell stories of their own but this self-described “conceptual collective of musicians, artists, and poets” takes that expectation and makes it the featured element rather than a supporting role. The combination of Storytellers’ neo-soul, hip-hop, progressive, and world music inclinations sounds initially like deliberate pandering for wider connections but really, the collective band has tapped into a style and setting rather overlooked in today’s age of short videos and vine clips: Extended pieces devoted to painting a picture explicitly through mindful listening. The base of “Grey Wolf” is constructed from a place of instrumentals and quiet contemplation. Gentle bass strums, a subtle reverberating wave of timpani mallets on cymbals, and even a sprinkling of ambient noises like the sound of a screeching metal door or gate opening at just under 90 seconds in – the track unfolds much more like the score to the scene in a film or a narrative-style video game. One of the band’s seemingly more odd influences is “Hayao Miyazaki Films” and yet such an intro, in addition to lyric verses late in the track, (I’m saying play the beat, let it go / Freer than most, adios demons and ghosts / Pressure feel like it’s s’posd / Getting close, this your brain on hope) feels like it could be right at home in the slightly eerie, spectral world of “Spirited Away” or the industrial world of “The Wind Rises”. After sonically settling a listener in with these scenery sounds, Storytellers do change gears somewhat abruptly – their poetic, hip-hop and jazz colors blending together right from the first bass and snare hit downbeats. “Grey Wolf” is packed to the gills with lyrics and a mild level of rap / beat poetry slanted repetition (It’s for the very best if you don’t / It’s for the very best if you don’t look back / It’s for the very best / It’s for the very best if you don’t; look-) but Margolin’s speaking voice is, while plenty more than articulate, not ever abrasive in its vocal attack of “Grey Wolf’s” words. Most enjoyable, is the way all of the parts manage to align with the spoken word and despite being large in quantity, Storytellers’ cumulative group sound never overwhelms. The basses in particular, have been set with a softer tone but, not so much as to sound fuzzed over – just no pluck to cut through each other – contrast to what one might presume of the very jazz-oriented vibe projected by the whole band. No one would turn a head if the basses were to gravitate toward such a signature sound, such as what is often seen and heard at New York’s remaining spots known for jazz, like The Blue Note, Jazz at Lincoln Center, Birdland, and Cornelia Street Café. The nearly 10 minutes of this track are broken up by recitation of lyrics over the jazzy foundations and two instrumental breaks that are significant enough for the band to note in their writing of the lyrics on Bandcamp, as “Solos” and “Rave.” The latter is a second extended set of solos like the first but, what’s key, is the way the song is able to again change its musical vantage point with an injection of synths that pour out their tones like a gently bubbling brook, hence the “Rave” vibe. Approaching close to the end of the track, “Grey Wolf” might now come across like its trying to be three different (kinds) of songs, each of which were simply combined into a track worthy of progressive style associations. Yet, the recurrence of a 10 note motif carried primarily by Schaper’s trombone, Rufolo’s bass clarinet, and Vitale’s tenor sax provides the melodic consistency and instrumental rudder needed to showcase “Grey Wolf” as the compositionally heavy, beautifully layered, and genre-fluid – but definitively singular – piece of collaborative work that it is. 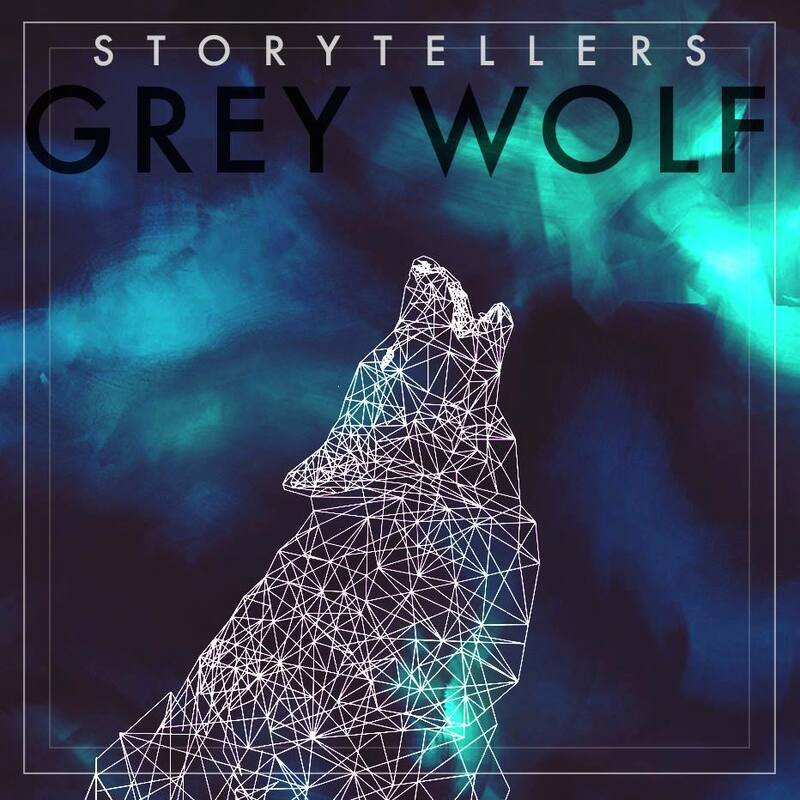 “Grey Wolf”, along with Storytellers’ eponymous demo (independent, Jan. 2016), are both available now via Bandcamp and SoundCloud. See Storytellers live, at their Sunday “Story Time” residency with The Velvet Lounge in Setauket, NY. Notes: An earlier version of this review mentioned inclusion of guitars in the song. “Grey Wolf” contains no guitar tracks and the review has been updated to reflect this. Tim Margolin was also listed as a full-time member of Storytellers. Margolin collaborated with the band on this single but is only a guest artist. Changes have been made to reflect the distinction.